Keith Jarret might play a small role in Henrik Sørensen’s great interest in the jazzy part of improvisation on the church organ. Today Jarret’s album from 1976 Hymns/Spheres is a classic and it has just be re-released by ECM Records. Sørensen doesn’t mention Jarret as an inspiration, and he doesn’t have to! The church organ has been used for improvisation through centuries and Sørensen has a background in jazz, classical music and as a church organist. His first album with improvisation on the organ was released in 2010. It was the intention, then, that the next album should consist of written music composed by jazz people. Instead we got a double CD with original, improvised music, recorded in two different churches in Denmark. Different in size and therefore different in mood and sound. The albums were made in Vor Frue Kirke in Assens and in Ørsted Kirke on Fyn. The one from Assens is big in volume and sound. The same is to be said about the music: it is big and at certain times violent. The sound of the room is evident on this very fine recording. In the small church in Ørsted it is the chamber feeling which is at center. The sound is condensed and almost intimate. And it reflects in the playing of Sørensen. It becomes kind and straight forward. The twelve parts of Aer Ludus Suite are without a doubt my favorites. I’m lost in a time-dissolving peace, whenever I listen to them. You find melody and they have an nice accessibility even though you find attitude and strangeness. Genres are to Henrik Sørensen something which floats and that openness can be heard at all times. 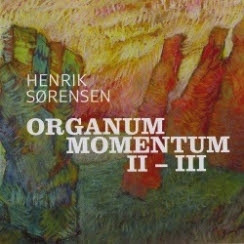 Organum Momentum II-III is a worthy follow-up to the first album. It is both admirable and important that music like this is released.